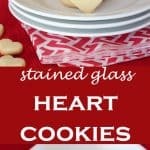 Stained glass cookies are often reserved for Christmas but I had never made them before and thought that baking them in HEART shapes would be fun with the #CreativeCookieExchange group this month. This particular recipe comes from Martha Stewart’s site. I’ll include the link below so that you can click through to the full recipe. I used crushed LifeSavers for the middle and liked the effect of the “stained glass” but found that it was terribly crunchy to bite through. My second try brought Swedish fish candies to fill the middles. Simple roll out a Swedish fish with a rolling pin or by squishing it with your clean fingers then use your small cookie cutter to make the same shape as you did in the cookie dough. Press the candy into the middle of the unbaked dough and then baked for the recommended time. This choice helped me twofold: 1. I liked the softer center to the cookie and didn’t worry about breaking a tooth! and 2. Placing the red middle in first to the raw dough saves the step of adding the crushed candies midway through the baking time. Granted, the Swedish fish do not give that window-like look when you hold the cookie up to the light but they certainly are pretty and they taste good too! Want to skip the filled middle all together? That works as well, this is a good recipe for a standard sugar cookie with a shortbread taste. Here’s another recipe that works well for Valentine’s Day– chocolate avocado pudding. It’s a chocolate pudding that you can feel good about serving your family. And it tastes great! Stained glass heart cookies made with a candy filling of Jolly Ranchers are a festive treat for Valentine's Day. Please click through for the original recipe from Martha Stewart's site. 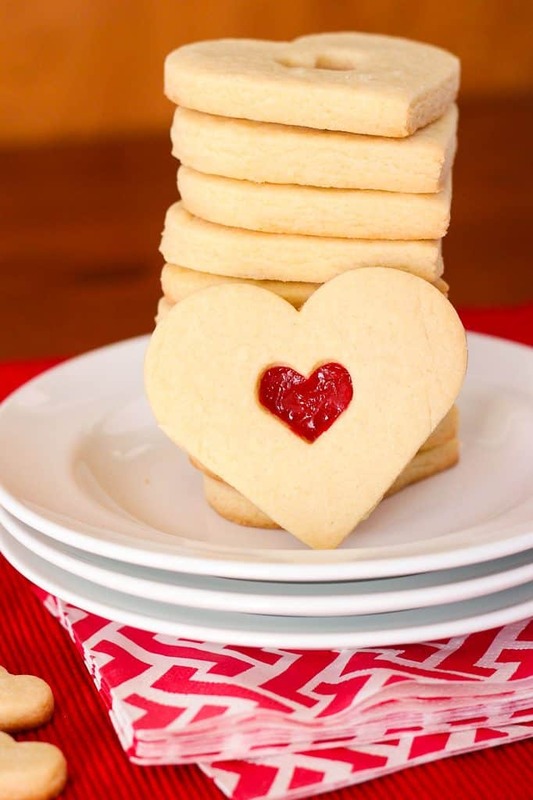 We have all sorts of cookies to get you thinking ahead to Valentine’s Day. 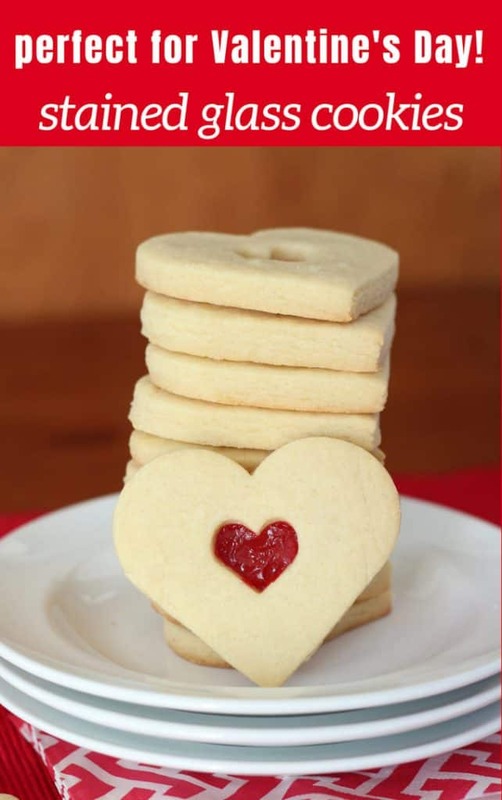 Do you have a favorite cookie to bake and share with family and friends for Valentine’s treats? We’d love to hear about it. Check out the list below for our festive ideas, you’re sure to find one you’ll love! Are you on Pinterest? I am! Join me there and save this Valentine’s Day idea! So pretty! I’ve always wanted to make stained glass cookies but didn’t relish the thought of breaking a tooth on the candy. Love your idea of using Swedish fish––very clever. Wondering now if gummy bears would work––definitely worth a try. Thanks for the inspiration! Oh I like the thought of gummy bears! Fruit roll ups are another thought perhaps? Picture perfect cookies, they twinge at my heart! Would love to give these for Valentine’s Day!! Thanks, Tara, I think I’ll make them again closer to Valentine’s Day. I should have made a double batch and frozen them! Those are adorable Holly! I’m not sure what Swedish fish are, but they sound so much easier than the hard candy! Those are simply adorable Holly; great idea! Thanks, Barb! 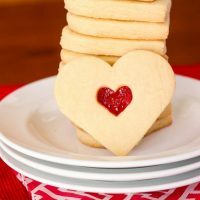 Hearts make every cookie just that much more adorable but, you know me, I’d eat a cookie in any shape! Using Swedish fish is a great idea! I have tried hard candies in the middle of cookies before, and I always thought they were too crunchy. Beautiful cookies and love the idea of the stained glass look. Don’t know what Swedish fish are but they looked like they gave a wonderful effect. I remember making cookie ornaments to hang on the tree with life savers but I wouldn’t have wanted to eat them either. Great idea! What a beautiful cookie! I myself have never attempted these cookies, but after seeing these I’m eager to try! Lovely just lovely! The Swedish fish are a brilliant substitute, Holly! Your pretty cookies are absolutely perfect for Valentine’s Day or any time you want to spread a little love around.